GetResponse is a multimedia online marketing business that specializes in email marketing, currently serving more than 300,000 users around the world. The company focuses on offering users affordable prices for premium service, boasting a 98% email delivery rate. The company prides itself on sending Responsive Web Design emails, which allow subscribers to easily read and navigate across devices ranging from desktop computers to smartphones. GetResponse estimates that this approach could reach up to 42% more readers, which could likely translate into more sales for your business. GetResponse provides hundreds of email templates for you to select from, all of which are easy to use. Unlike some services, you can send unlimited messages every day with GetResponse. 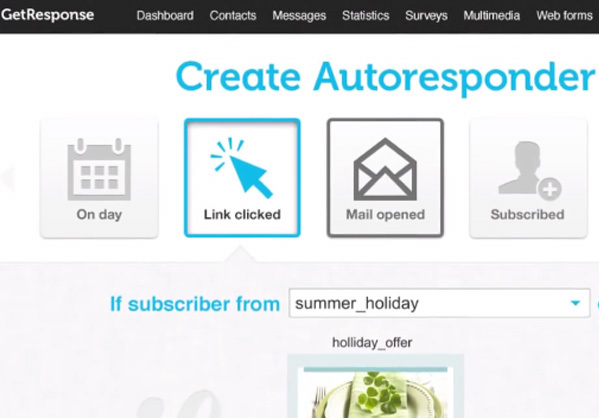 Additionally, you can set up autoresponders to generate custom messages for your subscribers, like notifications of daily deals or to simply congratulate subscribers on their birthday. 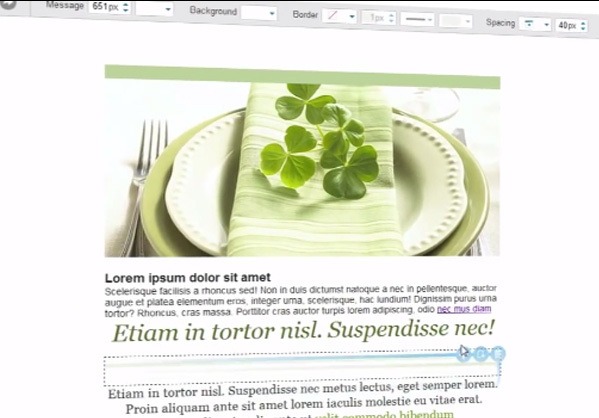 Images can easily be uploaded from your computer or from an iStock library to further personalize your email campaigns. If you already have a list of email addresses, GetResponse allows you to import it from popular email programs and services like Apple Mail, Gmail and Outlook. You can very easily import contacts in six different formats: CSV, TXT, VCF, XLS, XLSX and ODS, which should all work equally well. Additionally, you can segment your contacts into lists of targeted groups of your choosing. Because GetResponse understands the importance of insightful metrics and versatile optimization for your campaigns, the company helps track your newsletters within Google Analytics by adding specific parameters to links in your newsletters. 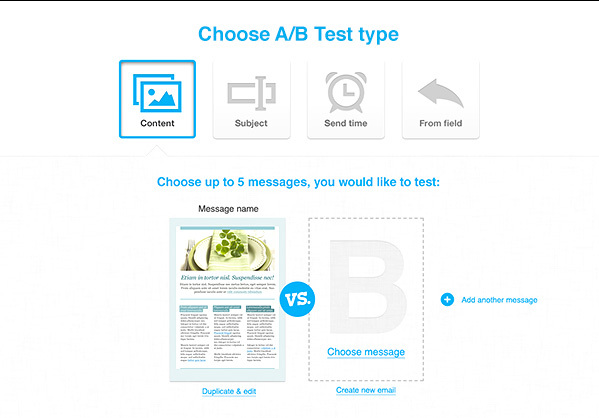 You can even conduct your own A/B testing on your campaigns so you can modify and improve them. You can A/B test numerous aspects of your emails, including the template, subject line, name of sender, time of delivery, day of the week, calls to action and overall length of the email. You can test as many as five versions of any of these elements to learn which works best; after the results are in, you can set it up so that GetResponse automatically sends the most effective version. GetResponse offers an invaluable subscriber history tracking and editing tool that allows marketers to show all details collected about a subscriber in one place. Simply click on any subscriber to see every bit of information the contact has provided. Most importantly, you’ll be able to see what the subscriber opened and what they clicked on in your messages. To keep your contacts abreast of promotional offers or events, you can readily employ drip marketing, which relies on ongoing offers that gradually build to a response. GetResponse’s website details different ways to create more effective drip marketing campaigns, so it may be wise to consider the free advice. GetResponse can integrate with many customer relationship management software platforms, including Salesforce, Capsule CRM, Magento, PayPal and Zendesk. Additionally, you can readily integrate Shopify with GetResponse so that you can add your e-commerce customers to any GetResponse campaigns. Email bounces are broken into two categories: hard bounces, which are permanently blocked (such as when an email address has been deleted), and soft bounces caused by delivery issues like a full inbox. GetResponse will resend your message to address that soft bounced four more times within a 32-day period until the email address is deleted from your list. Hard bounces, on the other hand, will be automatically removed. You can download a list of bounced emails, which also lets you see which emails were marked by the recipient as spam. Each factor is tallied separately. To help avoid landing in a junk mail folder, you can run your emails through the latest version of SpamAssassin to assess for potential red flags. By utilizing SpamScore, you can determine the likelihood of your message landing in a junk mail box. GetResponse also offers resources on its site to help you avoid making these problems in the first place. GetResponse provides more than 500 newsletter templates geared toward businesses ranging from restaurants to health care providers. Email campaigns are encoded in MIME, which means that you can still reach your subscribers who only accept text-only emails, yet still send the HTML email that you designed to the bulk of your subscribers. GetResponse offers a free 30-day trial that allows for cancellation at any time with no contract or credit card required. The following are pricing tiers for various packages. Non-profits qualify for 50% off these rates. With a plethora of templates to choose from and the ability to customize emails, GetResponse can help you better represent your brand’s identity. Though this intuitive and simplified approach helps users of any experience level to create campaigns, you can rest easy knowing GetResponse’s customer support team can be contacted by email or phone Monday through Friday, 8 a.m. – 8 p.m. ET, and Saturdays, 9 a.m. – 5 p.m. GetResponse also provides its users with a robust online resource center, which features video and PDF tutorials, as well as monthly webinars covering topics like “Fast Track to Email Marketing Success” and “Web Forms & Segmentation.” So whether you’re an email marketing new-comer or a seasoned pro, it’s easy to see that GetResponse gives you some serious bang for your buck. The rankings and ratings expressed on this site are the opinion of EmailMarketingServices.com and are subject to change monthly based on the criteria below. To keep this valuable service free, we generate advertising revenue from some of the companies featured across our site. Email marketing is the best way to stay in contact with your customers, followers and fans. Personalized communication can increase sales, boost reputation and spread knowledge of deals and services. The companies we’ve profiled offer premium direct-response marketing services at competitive prices, allowing highly customizable campaigns without breaking the bank. Whether you’re a newcomer or have extensive experience with email marketing, these companies could help take your campaigns to the next level. 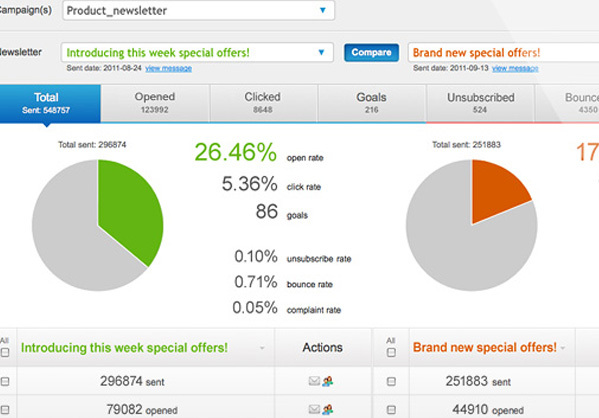 Start your Email Marketing Campaign with Benchmark.com!